A trip from late autumn. 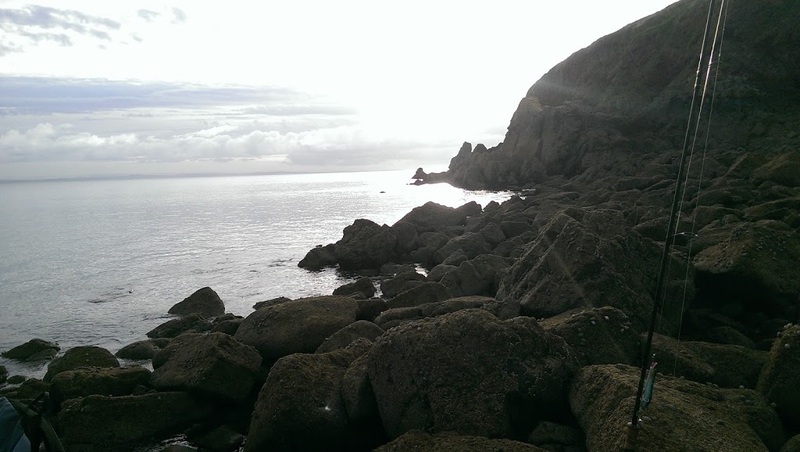 My recent fishing venues have involved beaches rather than pegs and river banks and with a few days off the wife and I managed to sneak off and have a few nights away in Saundersfoot, West Wales. It’s a place that I spent several summer as a child and a place where my brother did a lot of fishing while he was growing up. That said I gave him a quick ring for some advice on how best to tackle my chosen venue – Monkstone Point. The weather wasn’t really playing ball and nor were the tides, with high tide coming in at just over 5 meters. To put this into perspective, 6.5 meters is a standard size tide around this part of the welsh coast and 8 meters is considered large. A 5 meter tide is positively miniscule and means that the water will come in, but not by very much. Still, I endeavoured to get 2 sessions in the hope of breaking my duck an finally catching something from the coast. My first session was an evening one which involved a 3 mile walk along a Pembrokeshire Coastal path which is in serious need of a tidy up. Ducking under fallen trees, scrambling up and down muddy tracks before traversing 198 steep steps to arrive at Monkstone beach. I made a beeline across the beach for the rock and began to clamber up across the rocks looking for exposed gullies and pools. There was a fair amount of colour in the water so I decided to try a Savage Gear Panic Prey. This lure has a great rattle and creates a lot of commotion when retrieved in a “walk the dog” style. 20 minute of casting around didn’t get so much as a follow, this was coupled with a rising wind from right to left. To be honest it made my time fishing on the point a bit unpleasant. That coupled with scrambling over razor sharp rocks and barnacles (which left me with a memento) saw me change my lure twice (first to a shallow runner and then to a weedless jelly lure) before hopping back on to the beach. I’ll be totally honest, standing exposed on the lonely outcrop of rock on my own didn’t feel like a particularly safe experience, especially with the waves crashing around my feet. I know that my brother has fished the venue for the entire high tide cycle, getting cut off and coming off after once the tide has turned. But on your own, the prospect of being cut off didn’t fill me with joy. 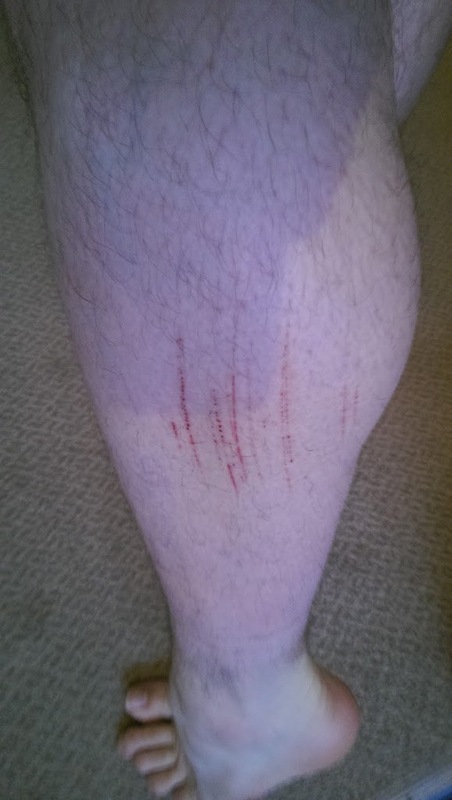 Not had a graze like this since I’d fell off my bike when I was 14! Watching the fry move you could almost predict where the bigger fish would be behind them. I think the predatory fish were using the murk to their advantage to smash into some the small bait fish. After 15 minutes a reasonable sized fish lunged at my lure, but in my anticipation of the take I struck and pulled the lure from its mouth! Then I painted the air blue. The fish however were unfazed by my outburst and went about gorging on the bait fish. I continued fishing for the next 40 minutes and despite switching to a smaller surface lure didn’t translate into a catch or even a take! Still more enthusiasm was buoyed and hoped to be back on the beach within 48 hours. Looks very fishy, but sadly didn’t deliver! I felt I needed a bit of a regroup after coming so close, so called my brother for his advice. His advice was spin from the left, float fish with “lives” from the right. I didn’t have the gear to fish live bait so I stuck with spinning. He also told me of a much shorter walk to the beach which cuts out the 2 1/2 miles of coastal path (still have to tackle the steps). I was going to fish 1 down 2 up with low water being 7:57am. It was very peaceful watching the sun rise through the clouds at 6:45, I had high hopes of catching. I started off with a medium diving, jointed lure which quickly came back with clumps of weed attached. I switched to a smaller Ryobi shallow runner which didn’t produce. 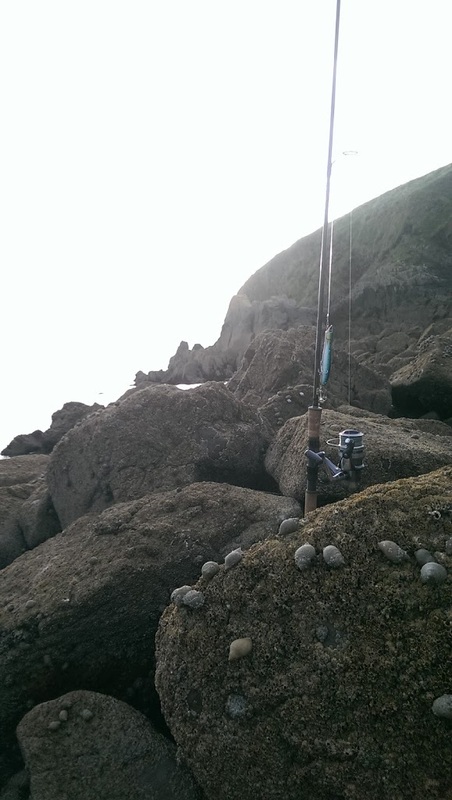 I moved up the rock through several gullies and switched to a Daiwa Shoreline. To cut a long-ish story short my Daiwa 140 shoreline got snagged about 5 feet from the shore, but from the shape of the rock it was snagged on a rock surrounded 6-7 feet of water. I didn’t fancy an early morning swim, and eventually my fluoro leader snapped. These lures and now discontinued. Gutted doesn’t cover it. I headed back to the causeway and switched through 2 surface lures (Panic Prey and Sea Spin 110) but didn’t see a single fish move. 2 hours and varying retrieves and casts had passed when I said out loud “I know when I’m beaten”. I wound in and made my way back to the steps feeling very disheartened. People say catching Bass doesn’t come easy. That’s true enough. Fortunately Pike season is coming, which is something I have more experience of. So Monkstone Point… it’s a difficult venue, and frankly difficult to access. The point itself obviously offers a lot more fishing opportunity than the causeway but fishing it (through the tide cycle) on your own is unwise. I have read that the beach fishes extremely well with Razorfish and Black Lug baits and I know the point fishes well with live prawns, crabs and blennies but these sessions were purely spent spinning. I would definitely to give the rock a proper going over, but I doubt very much that I’ll be back around here until at least next year, maybe even later although hopefully by then I’ll have some more sea lure fishing experience under my belt. Accessibility – *** Park in the layby on the lane leading to the Tre Vayne Camping site. Follow the beach signs through the farm, through the field and down the steps to the beach. Disabled Access – 0 – There is sadly no chance of a wheelcahiir getting anywhere near this beach. The terrain to and from the venue is far too severe. It’s a difficult ascent when you are able bodied and would be impossible otherwise. Enjoyed the read, but gutted for you! I know, now that I've got a bit more experience I think a smaller surface lure would have done the business. Then again, that's why they call it fishing not catching.